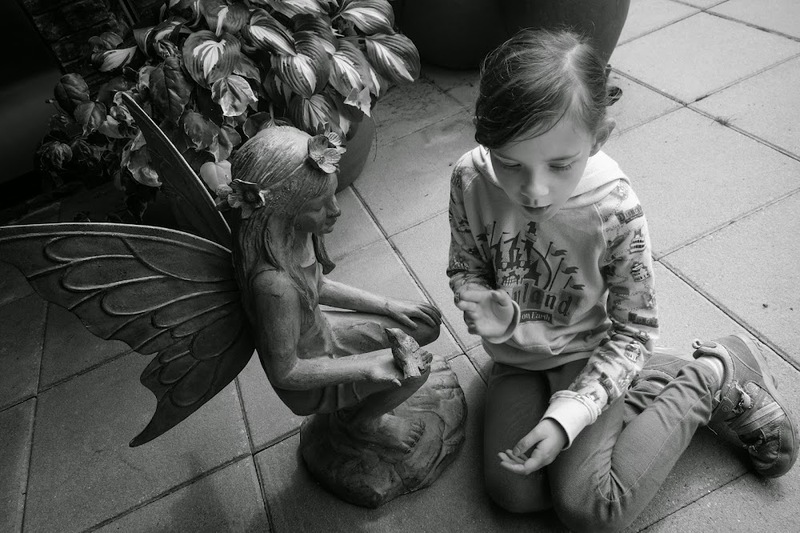 Julia: having a conversation with a fairy at grandma's house. I think somehow, I got behind a bit in my photo series here. I've been following Jodi's posting schedule for Project 52, and according to that, I should be on #24, so I don't know where I went amiss. Oh well. I'll post a double some week, or have an extra week come next January. So coming on the heels of seeing 'Maleficent', which we both LOVED ~ I had a fun realization of something I'd like to do: embark upon a live action fairy tale movie viewing spree with my kiddo! We just watched 'Ever After' (Danzel clued me in to the fact that it's on Netflix right now), and good golly how I love that movie, so I was super excited. Oh and the girly loved it as well. I'm thinking we might just have a Cinderella bender for awhile ~ try and get my hands on 'The Slipper and the Rose' (which I adore, and it was very hard to find before, but now I see that it's available on Blu-ray!) and a Rodgers & Hammerstein's 'Cinderella' version, which will be newly released on DVD this fall. And I simply CANNOT WAIT for the Kenneth Branagh version coming in 2015! Then we might move on to Snow White. Has anyone seen 'Mirror Mirror'?? I heard it was pretty bad, but would a kid like it?? I'm also thinking she's at the right age to see 'Enchanted' and 'Peter Pan'. I took the girls to see Mirror, Mirror at the cheap theater when it was out, and we actually liked it! Maybe having low expectations helps. We had a lot of fun. I love the Rogers and Hammerstein Cinderella. I saw the Leslie Ann Warren version first, because it was my mother's favorite. I like to listen to the Julie Andrews version, and I still haven't seen the 1990s version. I just checked out the book and movie Ella Enchanted, as I still have neither read the book nor seen the movie. Have you read or seen it? I'm psyched for the Branagh Cinderella, too! And I LOVELOVELOVE this picture! So cute. Happy Weekend! And Happy Father's Day to Andrew! I've neither seen nor read Ella Enchanted! Wait, I think maybe I saw 5 min of the movie, not sure why not the whole thing?? Goodness how I love pretty much ANY version of R&H's Cinderella!! But really fond of the Leslie Ann Warren -- I read that Julia is just IT, but the filmed version of hers is supposedly grainy and B&W. Would still love to hear her tho!! 'In My Own Little Corner' is such a lovely song. I was in the play in high school (i got to stand in the background, I was in the chorus) but it was tremendous fun. Very happy to hear the good 'Mirror Mirror' review! I've actually heard that it's good campy fun. And thanks about the picture, she was right in mid conversation with that fairy....;) HAPPY FATHER'S DAY to your hubby ~ he must be fab b/c he's married to you and he likes kitties and Downton Abbey and makes amazing fairy houses! The Julie Andrews version is on YouTube (and DVD), and yeah, it's an old Kinetoscope, and a bit hard to watch because of the quality. My oldest's second dance recital was themed "Cinderella's Wedding," so they used the Julie Andrews version of "In My Own LIttle Corner," and it's so beautiful. But easier to listen to than watch, yes! How cool! I love it. What a grand idea. Mirror Mirror was fantastic but the kids didn't like it as much as I did (bear in mind the kids in question are my rowdy bunch of son and nephews, 6 to 9 year-old boys who don't really care for girls but love the action and fighting scenes!) I did love Enchanted and Peter Pan as well! The kids too! Especially Peter Pan because they identified with Peter Pan and the Lost Boys. Wendy was very pretty and sweet. I think Julia would love her. oooh now I really want to see after the good endorsements from you guys! i think we'll love it. And I can't wait for Peter Pan, that version looks awesome, and I just love a Peter Pan story, however they spin it.